Maybe you have been thinking about selling a house in ... Tallahassee, or Tampa, or Toledo, or even Timbuktu. And maybe you have gone as far as listing your home for sale with a real estate company. So here's a crazy thought ... shouldn't you have high expectations of service when selling a house in Tallahassee or anywhere else in this world? So the conversation goes like this (starring one of Tallahassee's top listing agents whom we'll "call Rock"). Rock: I'm calling because I noticed your home is no longer for sale. Homeowner: Really? I thought it was. Rock: Are you still interested in selling a house in Tallahassee? Homeowner: Yeah, I gotta move. 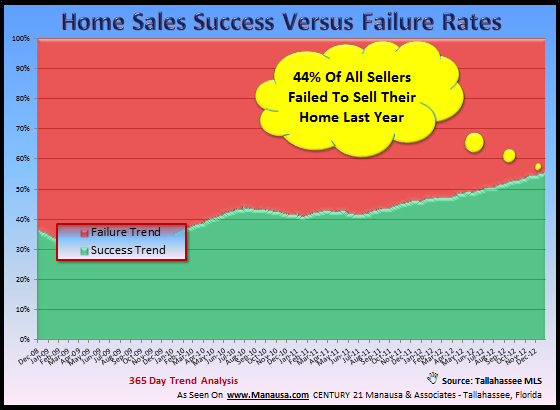 So here's a crazy thought ... with more than 40% of the people selling a house in Tallahassee failing to gain a contract, how is this seller not aware of what is going on in the sale of his home? Shouldn't somebody selling a home in ... ANYWHERE demand to be kept current of everything going on in the marketing of a home? And shouldn't this seller be concerned enough about housing market conditions to know the dates of his agreement with a real estate company? If you are selling a home anywhere, you should understand that it's not as simple as just calling any agent (unless you are willing to just give a home away). Today's highly competitive market requires the successful home seller to gain an advantage over comparable homes for sale in the local real estate market. While most of the market is willing to just put a sign in the yard and a lockbox on the door, the prudent home seller who is selling a house in this market is using a progressive home selling plan. With so many distressed properties for sale (banks want to get rid of the properties at any cost), you need daily promotion to help your home move to the top of the market. This year, more than 40% of all home sales will be short sales, foreclosures and REO (bank owned properties), so you should ensure that your real estate company is on the ball. People with property to sell that have equity will be working hard to gain the best buyer, and it won't happen by luck or by chance. If you want to know more about selling a house in this difficult market, just drop me a note and we can schedule a time to ensure that you have the best real estate agent to sell your home.